The Mitten Wife: A Laborful Weekend + Happy Medical Mondays! If you're new around here, welcome! I write about everything from our home renovations to my life married to a medical resident, and all of the good, bad and ugly that that entails. I try to be pretty honest about the struggles and celebrations that we encounter as we navigate this place called the medical world, which lead to the series "The Residency Forum." This week, I'm going to start a new part which I talked about ohh..humm.. a few months ago. But, life takes over faster than I can type or record it, so thank you for your gracious patience as I catch up. Until then, How was your Labor Day Weekend? I'll be honest, mine was a bit exhausting. I hit my pillow last night and was out like a light bulb, and may have whined when I heard the alarm this morning. Kyle was on call most of the three days, so I put my big girl pants on and decided to get A LOT of house work done. I'm talking painting, organizing the garage, mowing the lawn, caulking baseboards. Yeah, the really fun stuff. Oh, and we hosted a cookout and had a photo shoot and I got to hang out with my favorite almost-2 year old. Random side note: Ironically, we have a similiar picture with both of these couples from last year, and it was taken after both girls mentioned they were hoping to get pregnant soon. Welp, they are due three weeks apart! (Very soon, too!) 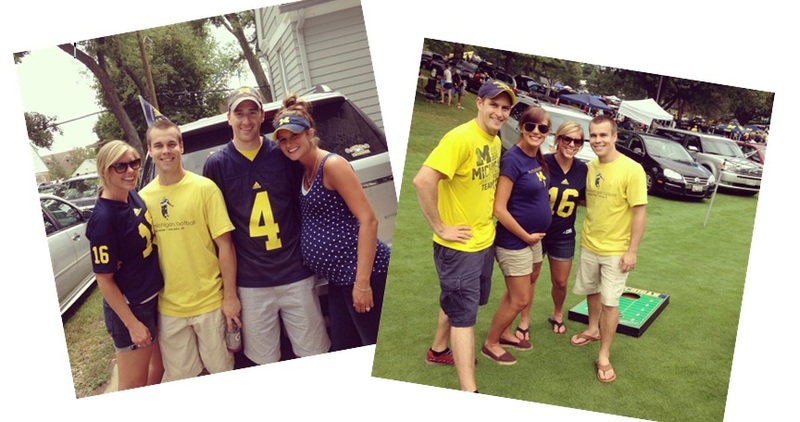 I think this can be counted as both of their babies first Michigan Football game. #futurewolverine. Okay, I'm done babbling. Hope you have a great 4 day work week and I'll be back in the next 48 hours to start the next Residency Forum! Can't wait to hear your thoughts!! I'm excited to read your post on the medical SO career. It is something I have been thinking about. YOu did have a pretty amazing August. Thanks for linking up with medical mondays - it's always good to see you on the board:-) I also loved your last post Letter to a College Student. Good advice. Stopping by for Medical Monday. I'm enjoying your blog! We did get some "football" in despite my Doctor working this weekend - though in our case it was European football. We woke up early Sunday morning to live stream our favourite Premiership soccer team. Maggie, isn't it funny how we can always seem to fit it in?! Great post you have imparted to theirs. When you learning about every one of those thing who have numerous impediment or hurtful for our great wellbeing then you can't touch or eat these things and visit page for valuable instructions for students and much more.